I had been to Witherspoons bar once before, and it was a live music night, and it was packed. This time, the Dining Out Team went on a Wednesday lunchtime, and whilst it wasn’t packed, it had a steady stream of customers. We felt there was definitely “something” that Witherspoons had found to keep the level of popularity going. Manager ‘Brooksey’ attesting that he had well over 100 patrons for breakfast the previous Saturday. The bar has a double shophouse frontage on to Soi Buakow, very close to the LK Metro and Soi Diana intersection. The interior features rustic tables, often over a beer barrel, but very comfortable chairs, and (wait for it) 23 TV screens. Parking is a slight problem as Soi Buakow is so congested, or be like me and use a motorcycle taxi. 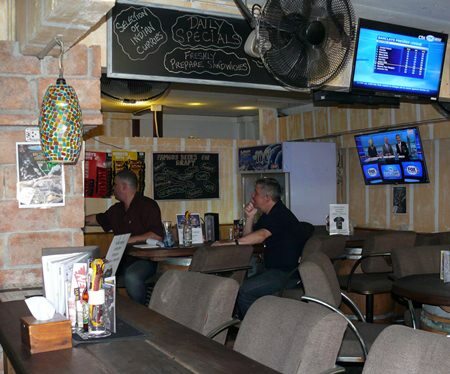 It really is a Sports Bar, covering American Football, F1, Moto-GP, Football, Swimming, Cricket, Boxing, Athletics, Horse Racing, English Premier League and probably tiddly-winks if it is televised anywhere! While we were there for lunch I took in a documentary on Rory McIlroy, watched a NASCAR race, saw the speedway from Leicester and others. There is not much that this sports bar will miss. The Manny Pacquiao – Floyd Mayweather fight has been planned for already, with “ringside” tickets B. 400 which also covers a bottle of beer and a beef burger or bacon roll. Note, you have to book for this one. And while mentioning beer, Witherspoons has the biggest line-up I have ever seen, with 12 beers on tap, including Hoegarden, Heineken, Magners and Guinness. If your favorite beer is not on tap, if it comes in a bottle, it is most likely that Witherspoons will have it, with 185 beers in the refrigerators. Prices are very reasonable as well, with Old Speckled Hen B. 100 and Hoegarden wheat beer B. 125. There is also a happy hour from 2 p.m. until 8 p.m. The menu is quite comprehensive and “Chilli” indicators are used throughout to indicate the level of spiciness. Breakfasts (B. 85-245) are all day, though there are some breakfast specials which close off at 11 a.m. There are also daily specials, most of which are B. 199. Other pub grub items include pies B. 195, sandwiches generally B. 120 and served with chips, the soup of the day B. 140, grill items mainly under B. 300 with tops at B. 565 for 250 gm Australian tenderloin, snacks and starters B. 90-175, mains B. 225-260, burgers B. 165-345, and Thai food B. 145, with chilli indicators as well as the Indian curries B. 239. 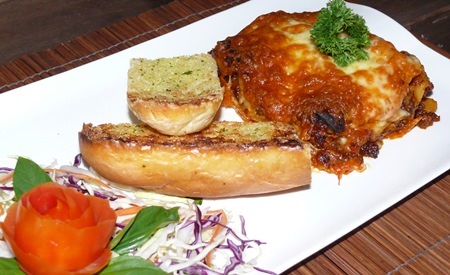 Madame chose the lasagna daily special (B. 199) and was very complimentary, remarking on the portion size, much larger than expected from a ‘special’. 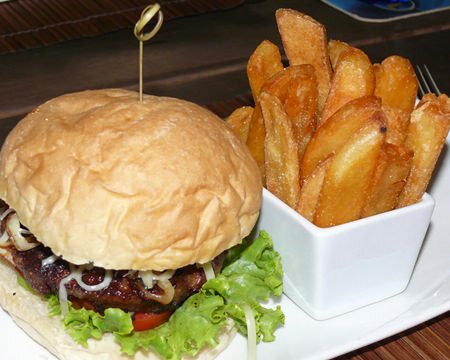 Brooksey had said that one of the more popular dishes was the hamburger, so I chose the beef burger with bacon and cheese (B. 225), which came with a side dish stuffed with golden chunky cut chips. The burger was also very large, the beef patty very generous and was almost too much for a lunchtime meal. This is certainly a place to go if you have a big appetite. We were both impressed with Witherspoons, and we could see just why it has been lasting so well – six years when many others fail to reach six months. We have no hesitation in recommending a visit to Witherspoons, especially if you are a sports fan, and doubly so, if you have a healthy appetite. Witherspoons Pub and Restaurant, Soi Buakaow (almost opposite Soi Diana), email [email protected] pattaya.com, telephone 038 721 121, http://www.witherspoonspattaya.com. Witherspoons is open 24 hours every day, but the kitchen roster is from 7 a.m. until 12 midnight.